Join the discussion on our forums! Come discuss Nethersoul Buster over in our dedicated Nethersoul Buster discussion topic. Very good card , if i ever play warlock again , i'm gonna add this card to my deck for sure. Dont sleep on this card, i didnt realize it adds the total damage, not +1 for each TIME you take damage. :p It can very easily be a big boy for only 3 mana. How did it even gain 12 attack ??? With Warlocks being real masochists lately I think this card could be pretty strong. Needs to be played in later turns but even turn 5 with tap makes it playable. Great synergy with the class it's gonna be in a lot of decks for sure. Masochism is coming back to warlock! I do not like the fact that it will be mostly used by aggro but still, it's within the class fantasy. It came back on witchwood. Im liking it. Crystallizer is a good card for Warlock, this especially if you like 5 mana 6/5s and Amethyst Spellstones. You can tap + Kobold Librarian into this for 6 mana 5/5 (+2/1) draw 2, that's pretty good. You can also hero power yourself as Bloodreaver Gul'dan if you draw this card without any other synergy and make it a 5 mana 4/5, which isn't that good but it's some tempo in the late game assuming you only did that because you drew it so late that all your synergy was used. Across all turns, you can do something to make this card not useless, making it only useless in your Gul'dan demon dead pool. Late Game: Gul'dan Bloodreaver active. 2) Use Hero Power on self. That's not a terrible turn. 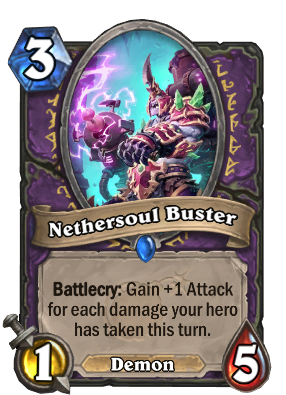 Nethersoul Buster + Crystallizer, 4 Mana 7/8 in total seems pretttyyyyy gooood. Kripp reviewed these cards back to back and didn't even mention the combo. I think it will see play. A single tap already makes this worth playing so it is really strong if used properly. Great synergy with anything that deals damage to your face. Anyone reminded of Darkshire Councilman by this card? Hey, Blood Witch synergy, cool. 5 health is a decent base stat for turning this into a 5/5 or a 7/5 if your lucky but still pretty easy to remove. Need to wait and see how this card turns out. This lets Spirit Bombs negative be positive!